For anyone of a certain age, shopping at the downtown J.L. Brandeis & Sons Department Store in Omaha was a pinnacle experience for the sheer size, opulence, and wonder of it all. Any city of size had its equivalent, but I didn’t grow up in any city, I grew up in Omaha, and Brandeis was all I knew when it came to mega department stores. It was my Macy’s or Gimbels or Marshall Fields. 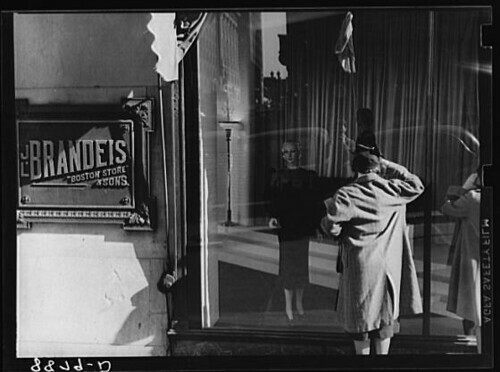 This two-part story is my attempt at taking stock of the Brandeis legacy, which eventually grew to include many stores in many locations, although the downtown flagship store was always the one people remembered. I certainly did. I used to go there as a kid with my mom. It was always an occasion. The family that owned the downtown store and ultimately a whole chain of stores and other business enterprises lived liked royalty, and my story is as much about them as anything. Whether or not you grew up with Brandeis as I did, I hope you will find this interesting if for no other reason than the larger-than-life qualities of that store and that family. My story originally appeared in the Jewish Press and served as the basis for a script I wrote on the same subject for a documentary film. Although most remnants of the Brandeis department store empire are long gone, the jewel in the crown, namely, the downtown store building, remains intact, though retrofitted as a condominium tower. I know a man who lives atop that building in the fabled penthouse, but that’s a story for another day perhaps, another forum, not on this blog. There was a time when every great downtown featured an immense department store. New York had its Macy’s and Gimbels. Chicago had its Marshall Field’s. Further west, smack dab in the middle of the Great Plains, Omaha had Brandeis. As local family dynasties go, few evoke the nostalgia the Brandeis name conjures. That’s because for a century J.L. Brandeis & Sons ruled the department store market in Omaha, serving hundreds of thousands of customers each year. In its heyday, the symbol of the company’s and the family’s success was the downtown store. Period advertisements billed it as “the greatest store in the West.” Modeled after Marshall Field’s, nothing quite as elaborate as Brandeis could be found from the Windy City to the Rockies. Designed by John Latenser Sr. in the Second Renaissance Revival style, the half-million square foot, brownstone edifice included ornate ceilings, Corinthian columns and marble floors. Its vast, sweeping spaces contained every imaginable good and service. So distinct was the store, it became a destination stop for anyone visiting Omaha. Its sheer size, fabulous amenities, everything under-one-roof selection and first-rate customer service set it apart from the competition. “Brandeis was really the source of most of the things you wanted. It was where you bought your first suit. It was where you went to have dinner with your friends…it was 10 floors of just a wonderful array of things,” Omaha historian Barry Combs said. All things have their seasons and as downtowns lost their competitive edge to suburban malls in the 1950s and 1960s department stores began to feel the pinch. Many closed in the ensuing years. Omaha and Brandeis were no exception. As the suburbs beckoned, Brandeis followed — building a mall, opening outlets. At its peak in the early 1970s, the family-owned retail chain grew to 15 stores, 3,000 employees and $100 million in sales. As fewer folks shopped downtown the flagship store became a drag. When, in 1980, Brandeis closed the downtown store as part of a general downsizing, it marked the end of an era. A leaner Brandeis became profitable again by the time Younkers bought it in 1987. More than 100 years of Brandeis retailing was no more. The dynasty dates back to company founder Jonas Leopold Brandeis. This family patriarch set The Great Man precedent. Born in 1837, the Austrian-Jewish immigrant was a tanner by trade in his native Prague. J.L. came to the U. S. in his late teens, part of a flood of immigrants helping settle the frontier. His self-made success story in America began as a merchant in the wilds of Wisconsin, where he traded with Indians. He married Fanny Teweles of Milwaukee and the couple made a life for themselves and their family in Manitowoc. A sportsman tradition that runs through the Brandeis family began with J.L., whose prowess with a gun became legendary. He next set his sights south on Omaha, a booming transportation, mercantile and livestock hub with excellent rail and river access. He, Fannie and their four children, Sara, Arthur, Emil and Hugo, moved to Omaha in the early 1880s. J.L. built the first of what would be several downtown Brandeis merchandising enterprises. The first retail venture, The Fair, opened at 506 South 13th Street. By 1888 J.L. and his boys were full partners when they rented a new site at 114 South 16th Street, calling it The Boston Store, a then-popular name for retail outlets. The J.L. Brandeis & Sons name first appeared over the door there and would appear, on building plates, on all future Brandeis stores. Business soon outgrew that location and in 1891 the family built a second Boston store on the northwest corner of 16th and Douglas, near what would become the anchor spot for the burgeoning Brandeis empire. J.L. was determined to succeed and not even the total loss of the building in an 1894 fire could deter him. He built a new, larger, better store on the same site. It didn’t take long for the mutton-chopped J.L. to make his mark, drawing much attention with lighted store windows at night and illustrations in newspaper ads. Every Saturday he released a dozen balloons containing coupons redeemable for a free suit of clothes. Thus, from the very start, Brandeis was known as a pacesetter and innovator. These qualities would distinguish the company and the family members who ran it throughout the 20th century. “It seemed like Brandeis was always very progressive with the things they did,” said Omahan Ted Baer, whose father, the late Alan Baer, was a great-grandson of J.L and the company’s last owner/president. As a savvy merchant, J.L. knew a prospering city and Jewish community meant more good will and business for Brandeis and so he and his wife immersed themselves in civic pursuits. He was involved in helping establish one of Nebraska’s first synagogues. He, along with Carl Brandeis, a relative he brought to Omaha, actively worked to create a chapter of the Independent Order of B’nai B’rith. An Omaha chapter was founded by Carl, who remained active in Jewish activities. Fannie and J.L. were also on the committee that promoted the largest event in Omaha history — the 1898 Trans-Mississippi & International Exposition, a five month-long fair of more than 4,000 exhibits on 108 city blocks that drew 2.5 million visitors. The Brandeis’ also served on the city parks commission that extended the system of parks and boulevards. By the early 1900s the Brandeis name owned currency with customers and vendors. His sons were already running things and they embarked on the family’s biggest expansion to date, construction of the giant Brandeis store, between 16th and 17th and Douglas Streets. Work began in 1906 and the $1 million building opened to much fanfare in 1907, displaying the latest goods from the post London and Paris trade centers. Eleven-year-old E.John Brandeis — Arthur’s son — was accorded the honor of laying the cornerstone. Originally 8-stories, the building qualified as a skyscraper by that era’s standards. Later additions brought the structure to its present height, complete with an Art Deco-style penthouse bungalow atop the 10th floor. Ads ballyhooed the new store as “absolutely fireproof,” a reference to the fire that destroyed The Boston Store a dozen years earlier. Any time of year the main floor mezzanine was a take-your-breath-away sight with its gilded columns, hanging chandeliers, copper-plated ceiling and brass-fixtured elevators hand-operated by white gloved attendants. A large clock near the 17th Street entrance was a popular meeting spot. A mosaic-tiled balcony offered secluded shopping and custom services. The bargain basement floor attracted teeming crowds. An arcade included an array of eateries — the Pompeian Room, the Tea Room, Hamburger Heaven and a cafeteria. 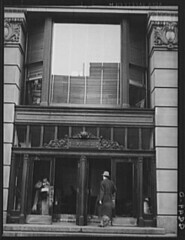 More than a flagship, the downtown store was THE center for commerce. It’s where people shopped and dined and caught up with friends or associates. It’s where you went to be seen. Where big wigs did business, sealed deals, made plans. Brandeis hosted fashion shows, parties, receptions, graduations and meetings. Not to be overlooked, Brandeis was viewed as one of Omaha’s own. “Locally-owned. Local ties. That was different than all the other department stores. It was kind of funny growing up because everybody I knew either had somebody in their family who did work or had worked at Brandeis,” Ted Baer said. Every city has its movers and shakers. Big wheels turned early Omaha from a prairie town outfitting Western Plains settlers into a modern metropolis of railroad, meatpacking, livestock, banking and mercantile interests. The names of those who made it happen — Kountze, Storz, Joslyn, Dodge, Reed, Hitchcock, Clarkson, Millard, Doorly — adorn streets and public places. The Brandeis name lives on, too. The executives guiding the company were more than merchants. They were part of the elite inner circle that called the shots. Through the years Brandeis family members filled the top executive slots in the company, but with its growth Brandeis increasingly looked outside the family. Family or not, the Brandeis name opened doors. When Brandeis spoke, people listened. Befitting their means, the Brandeis family lived like Midwestern rajahs with their mansions, stables of horses, recreational activities, parties, appointments, titles, world travels and charitable work. Newspapers detailed their comings and goings. Cousins George and E. John Brandeis cut dashing figures with their good looks and active pursuits. Fellow sportsmen, their exploits made much news: George with his prized horses and hunting of fowl in western Nebraska; and E. John riding, yachting, hunting on one of his big-game safaris or squiring eligible young women. Even in death, J.L. continued giving, as his will directed generous gifts to several charities, including the Creche, the Omaha Benevolent Society and Temple Israel, beginning a long tradition of charity by Brandeis heirs and descendants. Following in his footsteps, J.L.’s sons continued as community stewards. Arthur, Hugo and George each served on the Ak-Sar-Ben board of governors. The family’s association with the civic-philanthropic organization would last generations. After J.L.’s passing, his three sons found their niches. Arthur, the visionary, assumed the presidency. Emil, the builder, handled supervised construction and maintenance of the company’s early building projects. Hugo, the retailer, sent buyers to foreign markets and managed the store’s sales policies. Cousin George Brandeis joined them at the department store, first at J.L.’s urging and later at Arthur’s. George’s presence proved invaluable when a series of tragedies struck down J.L.’s boys, leaving George to take over. The first of these tragedies befell Emil. The lifelong bachelor had concluded his annual overseas trip in the spring of 1912, touring the European continent and Egypt with his niece and her husband. For his return trip, he boarded the Titanic as a first-class passenger and died in its sinking. He was 45. His body was recovered on an ice floe by the MacKay Bennett. He was wearing a dark suit, brown shirt with blue stripes, black shoes and silk socks. Among his effects were diamond cuff links, a gold knife, a platinum and diamond watch chain, a gold pencil case, a gold ring, a gold cigarette case and match box, a pearl tie-pin and a 500 francs note. Personal accounts of the disaster to reach the Brandeis family placed Emil at a card table when the “unsinkable” luxury liner struck the iceberg that spelled its doom. Upon his death, Emil’s will directed funds to the Visiting Nurses Association, an organization the family continues supporting today. Only months following Emil’s death, brother Hugo died, after an operation, leaving Arthur as the only Brandeis at the helm. Soon, Arthur cast his eye to diversify Brandeis interests with development of the Brandeis Theater, which opened up next door in 1910, joining the spate of motion picture houses downtown. Meanwhile, Arthur’s son, E. John, began learning the business as a boy, occasionally accompanying his father on buying trips overseas. With the loss of his two brothers, Arthur turned to cousin George, then manager of the Boston Store in Chicago, to join the family empire. By 1914 a restless Arthur left the store’s leadership to George in order to attend to his extensive realty holdings and to become vice president of Stern Brothers dry goods store in New York, where he took up residence. When Arthur died in 1916, his will left in excess of $1 million in personal property and real estate, in a trust, to his son, E. John. As a boy E. John had laid the cornerstone of the Brandeis department store. E. John had worked under his father at Stern Brothers, but at 21 was not yet deemed ready to take over the reins at Brandeis, where George remained in charge as general manager. E. John would have to learn the business from the ground up. George mentored the heir apparent. George’s tenure at the top lasted longer than anyone’s in Brandeis history. He grew up in Lieben, Austria. His uncle, old J.L., was already a success in America when he visited Lieben in the early 1890s. Impressed by his uncle’s tales of riches, young George returned to America with J.L., who put him to work at the family’s Boston Store in Omaha. George began humbly enough — checking parcels for customers. On his watch George is credited with growing the store’s market share. The growth continued despite the Great Depression and two world wars. Just as Arthur Brandeis brought George on board to guide the company, George brought in a key lieutenant of his own, only this time someone from outside the family, Karl Louis, a German immigrant. Brandeis and Louis met at Chicago’s Boston Store, where the two men forged a professional and personal relationship that lasted 36 years. Louis got the nickname “Cyclone Kid,” as his arrival coincided with the horrific Easter Sunday tornado that laid waste to miles of Omaha on March 23rd, 1913. With Louis looking after the store, George Brandeis turned his attention to developing Omaha’s downtown business district. Always looking to consolidate the store’s position and spur growth around it, George directed the Brandeis Investment Company in providing the land and the impetus for construction of the Fontenelle Hotel, the Omaha Athletic Club, the Elks Club and the Medical Arts Building. All became fixtures on the vital downtown scene. As Ak-Sar-Ben president George swelled the organization’s membership and led the drive to give Omaha toll-free bridges across the Missouri River. He was crowned King of Ak-Sar-Ben in 1931. Ak-Sar-Ben bestowed on him the honorary office of chairman of the board. Active in the Omaha Chamber of Commerce, George’s leadership extended to serving as a director of Omaha’s Union Stock Yards Company, operator of the world’s largest livestock market, and head of the Central Land and Cattle Company. George raised and trained show horses on his farm west of Omaha. Many of his saddle and harness horses won ribbons on the show circuit. He also owned a prized thoroughbred gelding, Hal Mahone, once valued at $20,000. Long before media titan Ted Turner invested in Nebraska’s rich ranch lands, Brandeis purchased a 30,000-acre Sand Hills spread, the T-O, south of Valentine, where he raised cattle. With George gone, cousin E. John installed himself as president. His early immersion in the family business was interrupted by military service during World War I. E. John was assigned a machine-gun unit at Camp Funston, Kansas and later made inspections of aircraft production. After the war he returned to the fold, opening Brandeis’s New York office, from where he networked with big Eastern jobbers and traveled to European markets. He remained in the Army Reserves, retaining a captain’s commission. On many of his store buying trips — to acquire textiles, chinaware and leather goods — his companion was the “Cyclone Kid,” Karl Louis. In 1924 E. John came into possession of the Brandeis store and investment company held in trust for him since his father’s death. Confident in cousin George’s management ability, he leftwell enough alone and remained a background figure. E. John bided his time, waiting for his chance at the top. t came in the late 1940s. He would guide Brandeis through the early 1970s. A dynamic man with a penchant for high living and the outdoors, he spent most of his time at his ranch in California, where he moved in elite social circles. While on the coast or off on one of his many jaunts around the world, he received regular briefings on Brandeis affairs. On monthly visits to Omaha he attended to business. So it was this largely absentee owner oversaw the company at its time of greatest growth. Change was in the wind, however, and Brandeis would meet new opportunities and challenges that forever changed the company and hinted at its fate. By 1948 Omaha department store J.L. 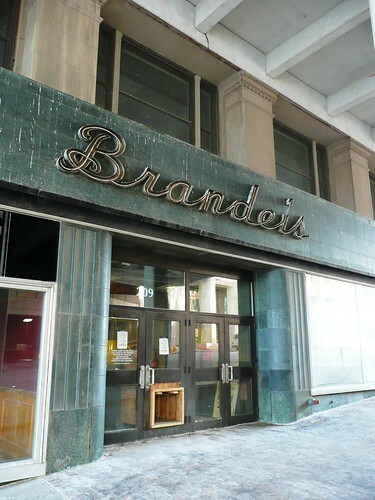 Brandeis & Sons ruled the roost with its grand downtown emporium. Founder Jonas Leopold Brandeis built an empire that his three sons, Hugo, Emil and Arthur, and a nephew, George, grew. Arthur’s boy, E. John Brandeis, took over as president/owner following George’s death in ‘48. When E. John assumed control Brandeis was still the only game in town. Its 10-story store was bigger, more impressive and offered more goods and services than any competitor around. Downtown was still the center of everything and Brandeis dominated that retail market. Things pretty well remained that way for the next decade. But the winds of change were blowing. By the late ‘50s-early ‘60s Brandeis faced an altered landscape. The new playing field changed the company’s status and forced a whole new way of doing business. Navigating Brandeis through this transition was E. John and his successor, nephew Alan Baer. Each Brandeis titan exerted his own style and influence. Without a doubt, E. John proved the most flamboyant. Start with his California retreat, the Open Bar Diamond ranch, whose house was a replica of his favorite big game hunting lodge in Kenya, Africa. A man who indulged his passion for the outdoors, he worked the spread himself. He lived most of the year at the ranch, but stayed in his Omaha penthouse atop the 10th floor of the Brandeis building on monthly Omaha visits. He held court there, playing bridge and hosting parties. The penthouse, appointed in Native American art and big game head trophies he collected, was featured in an Architectural Digest spread. Its interior was inspired by his ranch’s rustic decor. E. John’s disciplined habits found him riding and playing tennis most days. He was a regular at the Los Angeles Tennis Club, then the center for tennis in the U.S., and at Omaha’s Dewey Park courts. On the coast his playing partners included top pros and movie stars. When he wasn’t recreating, he was off on one of his hunting jaunts to Africa, India, Alaska or some other exotic locale. He bagged lions, tigers, rhinos, bears. He was on safari in Africa when word reached him the U.S. had entered World War II. At his request he went back on Army active duty, serving in the Transportation Corps at bases on the west coast. By war’s end he’d made the rank of lieutenant colonel. He remained on reserve status for years afterwards. Punctual to a fault, he expected the same from others, especially for the noon executive meeting or the two o’clock tennis game. E. John’s military-style inspections of the downtown store were legendary. With operations manager Ray Powers and other execs in tow, Brandeis would begin his tour on the 10th floor and work his way down to the basement, setting a brisk pace, alert to any speck of dirt or anything askew. “He was totally fanatical about cleanliness. I mean, if he saw anything amiss, he’d let you have it,” Dahlke noted. Always immaculately attired and groomed, he expected the same from his employees, who could expect a stern dressing-down if they didn’t look just right. Knowing he despised long hair on men, managers scrambled to hide, out of sight, personnel with offending locks. Even worse was if he overheard an employee say the store didn’t carry a certain item. And one never balked at an E. John order or request. “My predecessor made a big mistake one time,” Ray Powers recalled. “Mr. Brandeis was talking to him about something and this guy said, ‘Well, that’s not my job.’ I thought, ‘Oh, he’s dead,’ and he was dead,” Fired. On the spot. “He was quite a formidable man, and you didn’t walk up to him just to say hello,” said Marcia Baer, whose late husband Alan Baer was E. John’s nephew and the man who succeeded him as president. As in any kingdom, Brandeis also had department heads who ruled over their territories like lords. Maury Aresty had the Bargain Basement. Meyer Reuben, “The Famous Fifth,” where high-trafficked hard-lines were sold. Lester Marcus, the main floor. Turf wars were common on the sales floor. It’s what came with high-pressure jobs, strong personalities and rivalries to see who sold more. “These were the merchandise managers. They were tough guys. Brandeis was a rough-and-tumble environment. We had people working there that were big shots. I mean, they were kings,” Dahlke said. Away from the fray of the sales floor, things were more serene — usually. Much as George Brandeis immersed himself in shaping Omaha, E. John made it a point to convene meetings with fellow movers and shakers. These confabs, held in a private executive dining room at the downtown store, would bring Brandeis together with titans of commerce and industry. Their discussions put in motion projects to revive a restructured downtown amidst rapid westward expansion. In line with post-war trends that made Americans more dependent on creature-comforts, E. John, with Karl Louis and Ed Pettis now as his right-hand men, began a modernization program that saw the installation of escalators and air-conditioning. Responding to Americans’ love affair with their cars and a tight parking situation downtown, E. John ordered construction of the 18th Street parking garage. Affordable vehicles and gas meant greater mobility, a vital economy meant more disposable income, prompting the Great American migration to the suburbs. All of which led Brandeis to look at expanding beyond downtown. Omaha’s mid-town Center Mall was a harbinger of the future. Brandeis kept a close eye on it. When VPs Karl Louis and Ed Pettis broached the idea of leasing land on the outskirts of Omaha, at 72nd and Dodge, for a future outlet, E. John approved the acquisition. Louis and Pettis drafted plans for a dramatic new chapter in Brandeis history. “They had that property, which was pretty much the end of Omaha. That’s where the streetcars and the buses stopped. It was nothing but cornfields. And they were very nervous about it,” Dahlke said. Ted Baer, a son of Alan and Marcia Baer, said, “That was pretty progressive thinking…Stores didn’t have outlets like that back in that time. There weren’t malls yet really. They probably took a lot of heat for it, too.” Marcia confirmed the skepticism, saying, “Yeah, it was, How crazy can they get to think this would work?” But it did work. Brandeis took the plunge in 1959 qirh construction of the $10 million Crossroads Mall, anchored by the first new Brandeis store in half-a-century. Crossroads opened in 1960 to a lukewarm response before the mall caught on with the public. The project set in motion an era of unprecedented expansion, including the purchase of Gold’s department store in Lincoln, Neb. and construction of a massive distribution center in west Omaha. Guiding much of the later expansion was Alan Baer, the next generation to rise to prominence in the Brandeis dynasty. A nephew of E. John and a great-grandson of J.L., Baer was an Army veteran. He grew up in the San Francisco area. On summer visits to Omaha he got a taste of the retail trade. After the war E. John invited Alan to take a greater role in the store’s operations. Alan moved to Omaha and learned the ropes under Karl Louis, his mentor. With Louis’ death in 1959, Baer’s influence in the company grew. More and more, E. John deferred to Baer. “They had a tremendous relationship,” Dahlke said. Considered a visionary, Baer became the chief architect of Brandeis expansion with the addition of new stores in north, south and west Omaha, and for the first time — in out state Nebraska and in Iowa. Dahlke recalled, “Alan would have more ideas in an hour than most people have in a lifetime. He was an amazingly mentally agile person.” When E. John was still in charge, Baer would pitch him ideas, pushing for new stores, new ways of doing things. Not everything Baer proposed made the grade but enough did to keep Brandeis ahead of the curve. “Basically the guy that would sell it to him was Alan Baer. He would sell it to him and he know how to sell it to him and many times he had to…” Dahlke said. In his last few years, E. John’s active involvement waned except for pronouncements, groundbreakings, ribbon cuttings. He was more ceremonial figurehead than CEO. He continued making inspection tours. He also gave generously: $60,000 for construction of the Hanscom-Brandeis Indoor Tennis Center; and animals and big game trophies to the Henry Doorly Zoo. 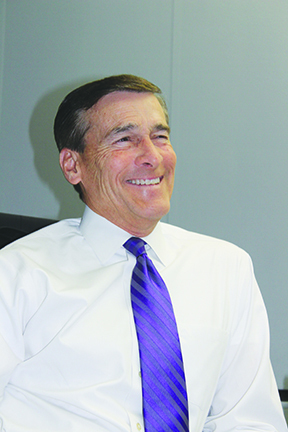 Where E. John had little input in day-to-day business, VP Ed Pettis did. “He was a crusty old guy. Very strong,” Dahlke said of Pettis. Pettis carried on the tradition of Brandeis executives involved in civic affairs. Dubbed “Mr. Omaha,” Pettis chaired the Golden Spike Days celebration in 1939 and directed Omaha Industrial Development Council activities. He lent his expertise to 4-H, United Community Services and Creighton University. He’s best remembered as general chairman of the College World Series when the popular event was still in its infancy. Pettis, along with advertising giant Maury Jacobs and Omaha mayor Johnny Rosenblatt, made the early CWS a success. “Ed Pettis was the one who really got the College World Series going. Without him and Maury Jacobs, it wouldn’t have happened,” said former VP Vic Mason. When Pettis died in 1963, Brandeis executive Jack Diesing Sr. assumed many of his duties, among them chairing the series. Diesing is credited with building the CWS into a national phenomenon and keeping it in Omaha. Today, his son, Jack Diesing Jr., heads College World Series, Inc.
“…I think Brandeis had a lot to do with the College World Series being here. There’s a lot of things Brandeis did as a community service,” Ted Baer said. More than anyone except E. John, Jack Diesing Sr. became the face of Brandeis. From the early ‘60s through the early ‘70s, the executive team of E. John, Alan Baer, Diesing, Vic Mason, Lester Marcus and Ray Powers charted the course. Where E. John and Diesing were public ambassadors, the others were classic behind-the-scenes men. Much as George Brandeis did with Karl Louis, E. John found in another German emigre, Helmuth Dahlke, an ambitious young man brought into the Brandeis sphere. As the trusted assistant to Alan Baer, Dahlke became an important cog in the Brandeis machine. He would remain with Baer long after the stores were sold. He was also a major supporter of the Pratt Institute for Individual Instruction. He left an estate valued at $12.7 million, half of which went to the E. John Brandeis Foundation, now the Alan and Marcia Baer Foundation. He also left $1.5 million to nephew Alan Baer, who took full control of Brandeis upon his death. Where E. John was a fashionplate who lived large, Baer was an introspective eccentric whose austere, frugal, bargain basement tastes fit his simple lifestyle. In his unconventional way, Baer might plop himself down on the floor during a business meeting. “But that’s the way he operated. A little eccentric. But a brilliant mind,” former VP Gene Griffin said. “Totally disarming. He was what I call an ice-breaker,” Dahlke said.Where E. John made a show of inspections, Baer made himself inconspicuous, passing himself off as a shopper. His door was always open but he wasn’t always in his office. He might be out on the floor or playing tennis — he loved the game almost as much as his uncle — or traveling to some exotic spot. Baer met his wife, the former Marcia Miller, at Brandeis, where she clerked in the French Room. Besides Dahlke, no one had Alan’s ear more than Marcia. By the late ‘70s Baer saw the changing retail landscape and realized it posed a threat. The emergence of national discounters like Target and the inroads made by departments store chains like Dillards and Younkers squeezed the market, cutting into Brandeis’ share and putting the Omaha company at a competitive disadvantage. A great booster of downtown — just as J.L., George and E. John were — Baer adored the flagship store but realized consumers preferred shopping at suburban malls. The times were making the giant downtown facility a white elephant. “It was very apparent that going forward a private company like ours would have a tough, tough time staying in business with the big boys — the national companies,” Dahlke said. The resulting staff downsizings were tough. Tougher decisions followed, none more so than the 1980 closing of the downtown store — the monument of the whole Brandeis empire — along with closing three other stores. The announcement made headlines. The downtown store’s last close-out days drew huge crowds. Generations of customers and employees expressed their nostalgia. It was like losing a beloved family member or dear friend. The building remained as a mixed retail and office center but with Brandeis gone the tradition was lost. The Brandeis store at the Crossroads became the chain’s new flagship. Renovations were made. But try as company officials might, it just wasn’t the same anymore. The oomph and awe were gone. Baer’s decision to close downtown was not made lightly. It meant letting go people who in some cases worked there decades. In larger terms, it meant abandoning the very core of what Brandeis represented. But as much as he wanted to keep the downtown store alive, he couldn’t. Still, Brandeis moved on and rebuilt its financial health. A fifth generation family member, Ted Baer, was being groomed to take over one day. Just as Alan and Marcia did, Ted and wife Kathy met working at Brandeis. When Dillards and Younkers tendered attractive offers to buy the company, Alan Baer ran the numbers and decided to sell the family business to Younkers in 1987. The sale price: $33.9 million. It was a classic case of head over heart. He wanted to keep the stores that were his family’s legacy but Brandeis neither generated the profits nor owned the capital to stay competitive. Once the deal was struck he didn’t look back, except to offer a hint of regret that Brandeis hadn’t parlayed its success to become a regional giant like Younkers. Alan kept ownership of Brandeis Food Service and began Alan Baer & Associates, an umbrella company for wide-ranging business interests — from coffee and nuts to travel services to publishing to sports teams to butterflies. Ted and his father’s longtime assistant, Helmuth Dahlke, joined Alan in the new venture, which gained a reputation for turning around small companies..
Father and son continued the family’s sportsmen tradition: Alan as an avid tennis player and Ted as a championship-level amateur bowler. They bought an amateur hockey team, the Omaha Lancers, that became a phenomenal success under Ted’s guidance. After his father’s death Ted went on to own a second amateur hockey franchise, the Tri-City Storm. He’s since divested himself of his hockey interests to concentrate his sports holdings in bowling with the Thunder Alley and Thunderbowl centers. Another Brandeis tradition, philanthropy, has continued. “Alan and Marcia were very generous. A lot of their generosity got no publicity,” Dahlke said” Countless examples abound, he said, of them quietly paying the rent or medical/dental bills of Brandeis employees in need. As it has for decades, the Alan and Marcia Baer Foundation grants monies to local cultural, educational and health initiatives. To the end Alan Baer searched for new endeavors to engage him, always on the look out for businesses to invest in, new challenges to overcome. It’s why Baer & Associates had a piece of so many different things. “You know what I always thought it was? It was like Brandeis, but not under one roof, because we had everything. We did everything,” Ted Baer said. Marcia Baer admits she doesn’t know much about early members of this fabulous family she married into. “I don’t know anything about them, except they obviously built a place called Brandeis,” she said. The solid foundation J.L. laid down, and that successive generations added onto, stood Brandeis alone, at the top of the heap among retailers and the city’s leadership. All things have their season, and after a century of success, Brandeis left the scene. Except it will never quite be gone. The downtown building where so much of its history was made still stands. It still goes by the Brandeis name. A dynamic new use for it is under way. Then there are the memories, which never quite seem to fade. Ted Baer said, “When we run into an old Brandeis employee it’s like we’re seeing an old family member we haven’t seen in awhile. It’s like old home week.” “Yeah, it’s like suddenly a step back in time, but it’s a good step back,” Marcia said. “Yeah, it’s a very nice warm feeling,” added Ted. Growing up in the Detroit areae we also had a version of J.L Brandis we call it J. L. Hudson they were as the downtown store was as Oppulent and as grand. With elevator operators who wore gloves and hats. At Christmas the windowns looked like Macy’s do now. I remembering driving to see the windows which was a Christmas tradition if you Lived near it. Too bad those stores are around who knew how to treat a customer. Thank you SO MUCH for such a fascinating article! I grew up in Omaha where Brandeis was THE place to shop! (and I’m talking pre-Crossroads era). I remember the highlight of Christmas was to go downtown, look in amazement at the holiday-decorated windows with all the toys & animated figures! Then, the AMAZING trip in the elevator (the only one I had been in) to the 10th Floor to meet SANTA! Brandeis was always a wonderland for me – so much that when I was old enough, I modeled for them while I was in high school, worked on the selling floor, then was honored to work in the Display Department – DECORATING THOSE VERY WINDOWS I was so in-awe of as a child! I eventually worked my way up the corporate ladder, finally having to quit after getting married & my husband got a job in Colorado. Alas, it was also the beginning of the end of the downtown store as I was a corporate executive directly working with the downsizing in the company & closing of the main store. A very sad time, indeed! Thank you, Leo, for this very heartwarming as well as heartwrenching story of the Midwest’s GREATEST STORE – J.L. Brandeis! Glad to have brought some sweet nostalgia your way. Please feel free to turn others on to the blog site, where you’ll find many articles about Omaha’s past and present. That was a very good history of the Brandeis store and family. I am researching a man who came to Omaha via Iowa from Scotland. His name is Alexander Marshall Watt and it seems that he worked in the Brandeis store for a long time in the flooring and carpet department. He travelled around the US for them. Can you tell me if there are any records of employees that still exist. I seem to be at a dead end now. Hi Ed, My father was a buyer for Brandeis too. What dept. were you a buyer for and when? My dad was there from 1943 at 16 yrs. old till 1968 when unfortunately he told Alan for a penny he’d quit this place. He started a stock boy to a buyer for drugs and cosmetics. His name was Don Wetherell. I worked in “Notions” (drugs) as a stock clerk in the early 1950’s. I recall a Don who was my boss in that department. Could that be the same Don Wetherell? I’m glad to hear from you. Well I’m not sure about my dad being a boss back in the early 50’s. I know he was an asst. buyer first and worked with a older guy whose last name was Jacobi (Ja-co-bee) and he was the buyer. Not sure what his first name was??? maybe Don too. I really don’t think he was a buyer until maybe late 50’s at the earliest but I’m guessing the 60’s. I wish I remembered the pharmacist’s name? He had dark hair and glasses and was jewish (that was the stereotype back then). I think his name started with a J, like Jules or Julian??? I don’t know. My dad, when he was buyer had a little office back in the corner with a secretary named Maude. Don’t know her last name either. It’s been a lot of years with a few other names that stand out who were employees in cosmetics. Lots of fun times when I was young at Brandeis. From the lunch counters and the cafeteria and the Tea room in the back. Discounted stuff in the basement that lead you to Woolworth’s and on to Penny’s. Or go under ground to the medical arts building. Up and down the elevators or escalators. Up the escalators to the mezzanine and restrooms. Christmas time to see Santa in Santa’s Northpole and all the toys. Used to park our car in the garage across the street on 17th and what fun it was to drive down the winding spiral exit. Remember the drug store caty corner from Brandeis….Name I can’t think of either??? If you have any memories to share please do. Your Brandeis story brought back great memories, I did not know very much about the Brandeis family. I love this kind of history, especially when I have a small connection. I recently watched and episode of Mad Men (which takes place in the ’60s) and started thinking of my years in advertising in the ’60s. I worked as a layout artist in the advertising department at Brandeis. I believe it was in l964 when Brandeis bought Golds in Lincoln. I was fortunate to transferred from Golds advertising department. I have been searching the internet for any information about the advertising we placed in the Omaha World Herald. Brandeis held a British Fair in l964 or l965. I was asked to create the advertising for the fair. I was overwhelmed to be given this opportunity. I used a picture of a bagpiper from the Black Watch regiment. It was a very simple ad, but probably my best work. I have long since lost my copy of the ad. The fair was great fun! The bag pipe regiment preformed, there was a double decker bus brought over from London and there were great parties,etc. I would appreciate and ideas in finding this ad or any Brandeis fashion ads. I have had no success with the Omaha World Herald site. 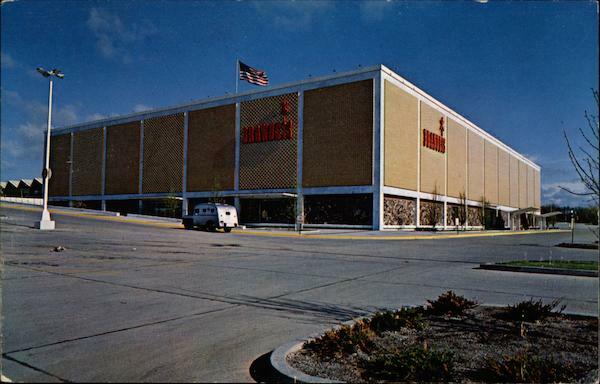 At age 36 I was the Promotional Director of the Brandies Southroads Mall in Omaha, Nebraska from 1966 to 1967. I met Mr. E. John Brandies once. Good looking man. If I had read your wonderful story about him and his family at that time, this South Ga. girl would have been shaking in her tracks. I didn’t know he was such an important man. You did a great job! Lump me into the nostalgia buffs who define so much of their childhood through the Brandeis store. I remember that my family could not afford anything other than the Brandeis basement apparel. We had our pictures taken with Santa every year on, I believe, the 10th floor auditorium. I would love the author to contact me with his research sources as I am working on an essay for my graduate degree program that connects to the store in the 1960s. that it is truly informative. I’m going to be careful for brussels. I’ll appreciate if you happen to proceed this in future. Hi there to all, it’s actually a nice for me to pay a visit this web site, it includes precious Information. I’m really impressed with your writing skills as well as with the layout on your weblog. Is this a paid theme or did you customize it yourself? Either way keep up the excellent quality writing, it’s rare to see a great blog like this one these days. keep it smart. I can not wait to read much more from you. This is really a wonderful website. I am an English teacher so I am confused as to your precise comments to Mr. Biga’s blog. So what is your connection to the Brandeis Department Store? Your main point is lacking in cogent details. Lily, read your remarks again and express you opinions in a reasonable and understandable voice. Thanks. Write every day. Don’t ever expect to be published. Read from the great writers but don’t copy their style. Find a job that will put a roof over your head and food on the table. Also, revise and revise and revise and revise. Find a mentor, preferably a college professor who knows her stuff and listen. If all else fails, keep writing everyday. A lot of times it’s very hard to get that “perfect balance” between superb usability and visual appeal. I must say you have done a superb job with this. In addition, the blog loads extremely fast for me on Internet explorer. Outstanding Blog! I say… I put things off a lot and don’t seem to get nearly anything done. The Brandeis Story – glad to have seen/read – once an interior designer with Brandeis , I did new residences for both E. John in California, following a forest fire and for Alan and Marcia when they added the enormous addition to their home in Omaha for Marcia’s mother. They were all generous and personable people. Thank you ! Interesting! E. John Brandeis was my stepfather for awhile. I have a book of photos taken on their honeymoon on safari in Kashmire in 1927. Thanks for this article. I’d like to read an article on the other downtown merchants (Kilpatrick’s, Herzbergs, Natelson’s, Goldsteen-Chapmans, Etc) who were also local. Despite the gentleman in the article’s assertion in the article, Brandeis was not the only local business. Kilpatrick’s, in particular, was Brandeis chief competitor for many years, and in my opinion, the nicer of the two stores. gracing the airwaves again (and digitally). things, The web site style is great, the articles is truly nice : D.
effect of its utilization, Dermefface has no recognized negative effects. Hi Dr. Duff. Just read your piece on Brandeis……great job and so interesting. Brings back so many wonderful memories. There will never be another Brandeis, that’s for sure ! I can remember my Mother taking Mary and me for lunch and a day of shopping at Brandeis……what a treat that was. And , of course, we were all dressed up. No jeans or slacks then if you were going downtown. Those were the days !!!!!!! Miss you. The old bag. There was an Omaha Cardinals Triple A baseball t-shirt in the 50’s sponsored by Brandeis. Free admission to Municipal Stadium if you wore the t-shirt. I’ve been searching for one of these t-shirts for over 3 decades now and will keep trying. As an 8 or 9 year old, it was excitement and a little fear taking that long bus ride from 67th and Dodge St. for a few hours of running around downtown Omaha. Most of my time was spent at Brandeis. Great memories. Adam Biga’s My Inside Stories <Liked it! Great article about the “Titans” of Brandeis. The store was a model of quality and innovation for decades. I used to work at the crossroads location and miss the people I used to work with. I always thought it would great to have a reunion of old employees, tour the area, go to the college World Series, visit the remains of aksarben, peony park etc. I would guess some type gathering would be possible thru all of the social media outlets. Thank you so much for the journey back in time. Brandeis was such an important part of my childhood. I remember looking forward to going downtown to see Santa on the 10th Floor. It was a wonderland delight for me. Taking manned elevator up to the magic floor. I remember getting to sit on Santa’s lap every year. My heart sings at this memory. After I was a little older I would take the bus downtown just to reminisce and shop in that wonderful store. You’re welcome. Thanks for sharing your personal experieces with Brandeis.